This is first of three part series article that will show you how to build fully functional application whose purpose is to keep track of multiple counter values that user can update (increments/decrements it’s value). This first article will describe all functionalities that application is supposed to have and we I will explain implementation of the presentation piece. Second article will be about persisting information of all counters using Android SQLite database and third and final article will provide you information how to present counter data and handle events that will trigger updates on the underlying database. Application that is developed in this article is published on Google Play here. Now let’s see how final product will look like and what options should it have, below is screenshot of application running on my phone. As you can see I named application Keep Counting, beside title of application there is application option menu item that is used to create new counter. Selecting this option will bring new dialog that user is supposed to populate with basic information: Title of the counter, starting value, incremental value and color of the counter. 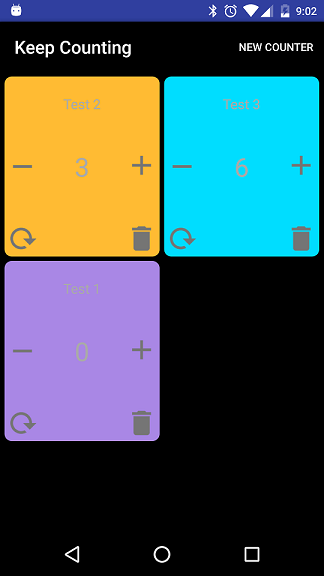 Main body of the application represents grid view that holds multiple counters created by user. Each counter is represented as colored square that displays title and current value of the counter. On left and right side of the counter value there are android image buttons used to increment value of the counter by value defined as increment on creating the counter. Finally for each counter there are additional two image buttons user to reset counter to it’s original value and another one to delete the counter. Every time user selects delete or reset button, application prompts user to confirm it’s action. This description provided above is represents all functionalities for this first version of the application and as promise in this first article we shall talk about implementing this presentation layer in our application. As a note, I am using Android Studio for development of this application but you should be able to use this code in any other IDE of your choice. On creating the project, Android Studio (just like any other IDE) will create project structure and generate MainActivity.java in java folder of the project and activity_main.xml in res folder of the project. I will not go into details of the project structure and what are the files that are generated initially on project creation by IDE, for these details and explanations you can go here on official Android Studio website. Also when I was creating project in Android Studio for type of activity in New Project wizard I have selected scrolling activity. As you can see this is just simple GridView, in one of our next articles I will define and explain how to create adapter for this grid that will be used to populate this grid. In general this is a relative layout used to place components in position relatively to other components or layout itself. For me to use this relative layout was always hard until Android Studio introduced nice visual designer so you will have to drag and drop components around the screen and Android studio will do rest for you. This is the end of first part from our three part article on this topic. Please do check blog for next part that should be ready soon.